I’m overdue for one of these roundups! RAY’S ARROYO. 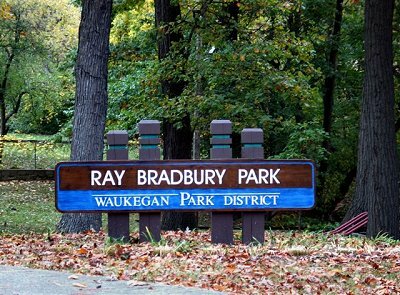 The Lake County News-Sun informs readers that “Literary Landmark status coming to Ray Bradbury Park and its storied ravine”. While many great American writers have had personal property honored with a Literary Landmark — locations include Ernest Hemingway’s birthplace in Oak Park and Mark Twain’s boyhood home in Missouri — the choice in Bradbury’s case was appropriate: Ray Bradbury Park, which sits just west of downtown Waukegan on the section of ravine he played in and walked to school through during his daydreaming boyhood.It is true that two of the buildings connected to Bradbury before his family moved to California are still standing — his family home on St. James Street and the Carnegie Library on Sheridan Road. But the home is a nondescript private residence, and the library is dormant and has an uncertain future existence. THERE’S SOMETHING IN MY EYE. Chuck Roberts at the Wonderbook blog has a sweet story about the author of “Dandelion Wine”. 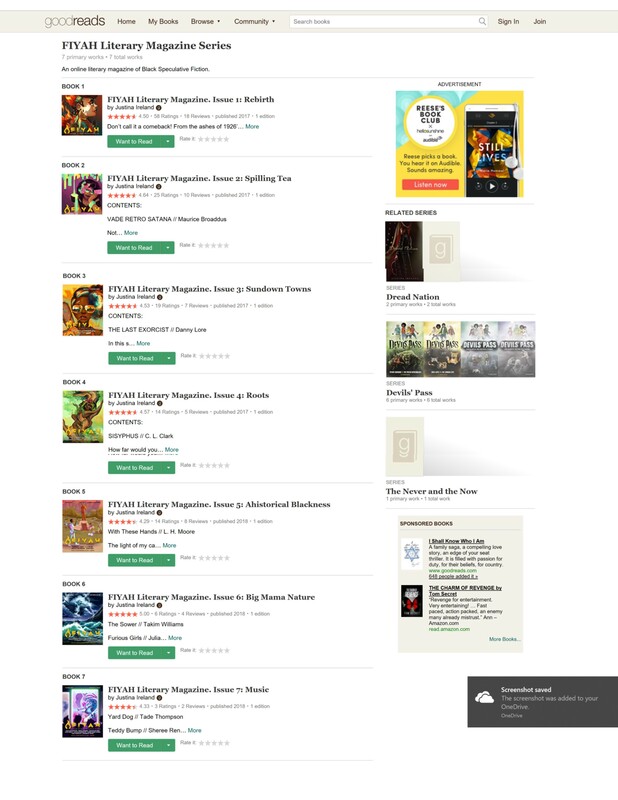 …Somehow word got from those SciFi specialists to Ray Bradbury’s bibliographer. Back then many collectors were “completists.” Completists would seek out any work by an author in any medium. Magazine appearances, radio or TV interviews … Ray and his bibliographer were completists. AND they had never heard that his TV series had been put on video. I suppose the Canadian company that produced the tapes went out of business. Maybe their mostly unsold tapes got destroyed. For whatever reason, for all any of the Bradbury experts knew I had the only copies of The Ray Bradbury Theatre extant. Of course I said yes. I was honored to have something a hero of mine wanted. I shipped them off to Manhattan or California. I sent them either gratis or at a very low price. Probably a low price. I couldn’t afford to give stuff away back then. If I recall correctly, I included a fan letter to Ray. The tapes were sent to his agent. I was too shy to ask Ray directly, but I included a note to his agent telling him I collected first editions of Ray’s and it would be cool if I could get a dozen or so slips of paper with Ray’s signature which I could tip into those books…. SURROUNDED BY HISTORY. The Indianapolis Star outines the ambitious plan for all the stuff that used to be in Bradbury’s basement office: “Unusual Indianapolis museum will house $6+ million of treasures from ‘Fahrenheit 451’ author”. 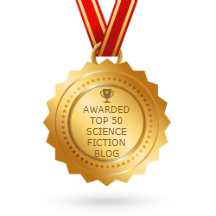 Marrying science fiction, space exploration, intellectual freedom and the human heart is no simple feat. But 30,000 pounds of letters, photos, manuscripts, books and paraphernalia at the Center for Ray Bradbury Studies offer insight into how the “Fahrenheit 451” author accomplished it. Part of the Indiana University School of Liberal Arts at IUPUI, the collection is jammed into 1,600 square feet of space on the first floor of Cavanaugh Hall. Its aisles allow only one person to pass through at a time. Movie posters and photos of Bradbury with Steven Spielberg, Joe Mantegna and Edward James Olmos line white cinderblock walls with mere inches separating them. The staff has to set out on filing cabinets his National Medal of Arts and Pulitzer Prize Special Citation for inquiring visitors. Considering the collection started in a 500-square-foot basement room, the current space is a step up. 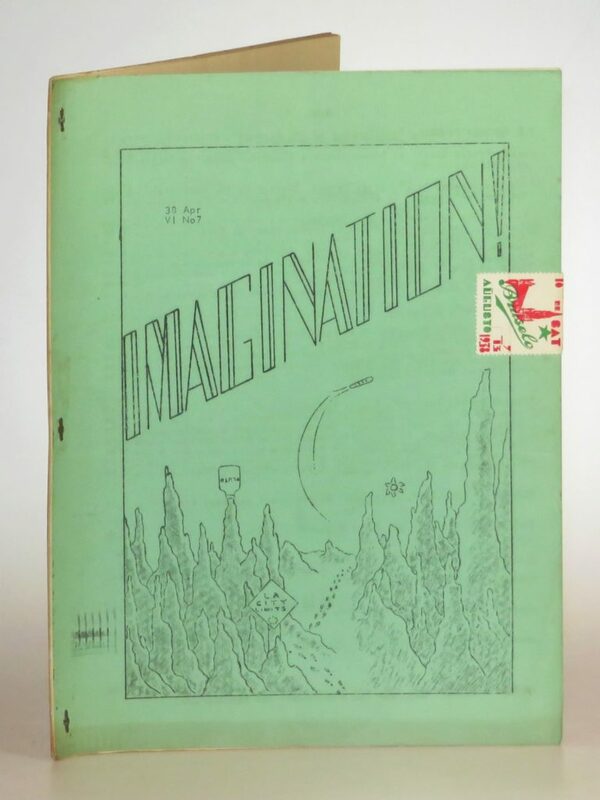 But its proprietors want more for what has grown into the largest collection of Bradbury’s personal and career effects. They want a national museum and archive that ideally would open in 2020, the centennial of Bradbury’s birth year. ILLINOIS READS. And the folks in Waukegan trying to create the Ray Bradbury Experience Museum (RBEM) are publicizing a local event which includes “A Tribute to Ray Bradbury”. Save the date for the Illinois Reads Book Festival, March 16, at Waukegan High School, 2325 Brookside Ave, Waukegan. Visit the RBEM table at this free event to promote the joy of reading and to celebrate Illinois authors. RBEM is proud to partner with the Illinois Center for the Book for this dedication in Bradbury’s hometown. We’re thrilled to celebrate Ray Douglas Bradbury, the Waukegan boy who became the author of “Fahrenheit 451” and “The Martian Chronicles” as the American Library Association’s United for Libraries network pays tribute by dedicating a Literary Landmark to Bradbury in Waukegan. TWILTONE CLIPPINGS. David Doering transcribed a piece from Imagination! #7 (April 1938) with Uncle Ray’s ingredients for a “success-fool” SF story. Hmmm…. “ffooti-pusses”?? “Ackermaniac”?? About 60 years old, he has invented some supercolossal machine that can warp time or destroy matter–take your choice. Then add a gob of mathematical equations & problems, 100 large words such as ultraforrest jackermanerless & lagoobrious. Then bring in a theory by the heels. Any theory will do. Also a son for the scientists to work side by side with, forging thru the innermost secrets of Science with heads proudly bent in meditation. Then have the foul ffooti-pusses arrive from Rigel, breathing poison! The scientist combats the incredible Monstrosities with artificial creatures of his own. let him rassle a lion as the earth cracks in 2 pieces..! Then drag in a few dead bodies (preferably Forrest J Ackerman or such stuffs) & let them play the parts of ghouls (on 2d thought, HanKuttner would be better suited to such roles–the Ackermaniac may be reserved for characterizations requiring dead heads) endeavoring to endanger the Sweet Young Thing. Have the sun explode or die. This is the end. Are you glad? Has this inspired you with an idea? If it has, write it down (or up) & airmail it to the dead letter office with the side off a barnacle, a Pogo stick & a manhole & we shall instruct Santa Claus to bring you a composite picture of all famous science fiction writers. Warning! The Karlottans among the kiddies will adore the toto…but keep it away from nervous adults! One glance will give your girlfriend a permanent wave!! BRADBURY RE-ANIMATED. A 2015 classic from Brain Pickings: “Ray Bradbury on Storytelling, Friendship, and Why He Never Learned to Drive: A Lost Vintage Interview, Found and Animated”. Yep, that’s right. For less than $50 you can, in fact, buy access to every class we currently offer. Did I mention it’s only through the 27th, aka three days (well, a little more since this is going out Sunday evening) only? Foz Meadows, who readily accepted Lou Antonelli’s apology for claiming Camestros Felapton is a pseudonym for Foz Meadows’ husband, Toby, said today she has a different policy and expectation for any apologies and retractions that might come from Dave Freer and others who ran with the story because of all the abuse they packaged with it. I would also like to note that while, as far as I know, Freer didn't email VD about my husband being Camestros – a falsehood now acknowledged as such by @LouAntonelli – VD has nonetheless run with Freer and Antonelli's original claims on his blog. One popular theory to explain why aliens have not made open contact with humans is the “Zoo Theory.” John A. Ball, an MIT radio astronomer, proposed the theory in 1973, suggesting that aliens may purposely be avoiding contact with humans so they don’t interfere with our activity, similar to zookeepers at a zoo or nature preserve, Science Alert reported. “ETI (extraterrestrial intelligence) may be discreetly and inconspicuously watching us but not dabbling,” Ball wrote in his paper on the subject. According to this theory, we are too unevolved and uncivilized to be a threat or burden to alien life, but rather than interfere with our natural evolution, they monitor us from afar. Of course, they aren’t completely perfect in their effort to stay out of human affairs, which is why we have several thousand alleged sightings each year. After Deadline this week revealed that Quentin Tarantino pitched a Star Trek film to JJ Abrams and Paramount, the whole thing is moving at warp speed. Tarantino met for hours in a writers room with Mark L. Smith, Lindsey Beer, Drew Pearce and Megan Amram. They kicked around ideas and one of them will get the job. I’m hearing the frontrunner is Smith, who wrote The Revenant. The film will most certainly go where no Star Trek has gone before: Tarantino has required it to be R rated, and Paramount and Abrams agreed to that condition. Most mega budget tent poles restrict the film to a PG-13 rating in an effort to maximize the audience. That was the reason that Guillermo Del Toro’s $150 million At The Mountains of Madness didn’t go forward at Universal, even though Tom Cruise was ready to star. The exception to this rule was Fox’s Deadpool, but that film started out with modest ambitions before it caught on and became the biggest R rated film ever. (4) Dodged the bullet: ScreenRant tells “15 Ways Star Next Generation Was Almost Completely Different”. Star Trek creator Gene Roddenberry did not like Patrick Stewart. Actually, that’s putting things pretty lightly. Star Trek creator Gene Roddenberry hated Patrick Stewart. He didn’t want Stewart to play Captain Picard, he didn’t even want him to audition for the part. The creator famously described Stewart as both “too old and too bald” to play the iconic captain. Roddenberry pushed heavily for Yaphet Kotto to play the ship’s captain. While we can’t imagine The Next Generation without Stewart’s devilish smile and never-ending sense of fun, but it’s hard to actually argue with Roddenberry on this one. Had Kotto been cast in the role, he would have given the Star Trek franchise their first black captain decades earlier. There’s just nothing wrong with that. By John Hertz: Happening to read D. Hoffman, The Billion-Dollar Spy (2015; Adolf Tolkachev 1927-1986), I came across this striking passage (p. 163) about the subject’s son in 1981. – my emphasis. There’s glory for you! (4) 45,000 signatures on a petition to remove Last Jedi from the canon. Solo will stay in the Star Wars family with veteran franchise composer John Williams set to write the theme for the standalone film about Han Solo, slated for release on May 25. It will be Williams’ ninth assignment. While the hype swirling around those silly little Porgs that pepper the screen in Star Wars: The Last Jedi is completely understandable based on looks alone, one group of characters has been vastly underrated, and frankly, it’s an abomination if you ask me. The dark horse I have in mind? The caretakers who keep the Jedi village on Ahch-To looking fresh as hell, that’s who.